ROSEMARY’S is 10 Years Old! June 19th marked the 10th anniversary of the opening of Rosemary’s. Geez Louise time flies! Can it be a decade since Michael and Wendy Jordan broke free of their Emeril bonds and struck out on their own? Does anyone remember that the odds of them succeeding were like 100 to 1 to against? But survive they have, and it remains one of our few, upscale, neighborhood success stories in the fine dining department. A recent lunch there showed off the food that made this place a hit to great effect. No pirouettes on the plate mind you, just solid, tasty restaurant fare using good groceries that are always respected, and always seasoned to a fare thee well. If our waistline allowed us, we would show up weekly just for the yeasty, butter-glazed rolls they serve. But as tempted as we are to fill up on them, we always save room for one of Mike Shetler’s hand-picked ales — right now he’s big on Dogfish Brewery Delaware Pale Ales, some of which are hopped to the extreme — or one of Jordan’s seasonal soups or entrees. Of those main courses, this is one off-Strip joint where you needn’t hesitate to go swimming. Farm-raised salmon gets a (justifiable) bad rap, but the Loch Duarte Atlantic version they serve here is bereft of the muddy, dull flavor that characterizes so much of this over-served fish. We could find no fault with the sea bass either. And his silky-smooth corn soup is truly a thing of beauty — tasting as it does of fresh-picked, sweet corn just like the strains (Silver Queen was a favorite) we used to get at the farmers markets in New England around this time of the year. Rosemary’s food doesn’t plow any new ground, the food isn’t always as pristinely displayed as we might like, and sometimes we wish Jordan would back off on the number of ingredients he employs in a dish, but there’s no denying his version of comfort food strikes the right note with his customers — who appreciate the quality, and the cooking, and the ambiance. Not to mention all those incredible ales and beers, and the 1/2 price wine nights on Sunday. Our lunch for two with an auslese-like Alsatian pinot gris came to $154 ($128 for food + wine + a $26 tip). Rosemary’s is always a solid choice. ELV is right that they’re not as innovative as some other “star chefs” in town. 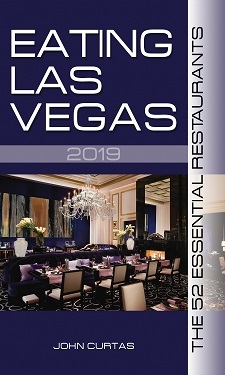 But then again, how many real culinary innovators (and I mean real vanguards, not just those that market themselves as such) are there in Vegas? Ahhhhhh, and those proscuitto wrapped figs stuffed with blue cheese, drizzled with a balsamic reduction….. Rosemary’s will always be #1 on my speed dial. 10 years! That’s like 100 in Vegas years. Good for them. They are awesome. Are these the dishes from the original menu 10 years ago? The food looks like poop. I really get a kick out of the sauces and garnishes on the rims of all the plates….. so slummy.